Tonight's the first night of Chanukah. 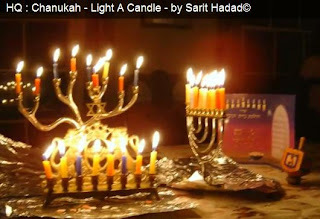 We have enjoyed the countdown, bringing you a taste of Chanukah every day for the past month, leading up to today. Let's light the first candle tonight and one more each night for the full eight days of Chanukah, and let's hope the holiday ushers in a year of good health, happiness, and peace for us and for all Israel. Tonight's Chanukah video features popular Israeli singer Sarit Hadad singing the song that she sang at the Eurovision Song Contest in 2002, accompanied by a Chanukah slide show created by Racheli Raz.